What should you look for when choosing a mentor for your child? Below are the three crucial qualifications we evaluate during our hiring process. The most obvious, of course, is someone who is knowledgeable in the subject they teach. Secondly, tutors also need to be able to communicate well. It is not enough to be knowledgeable if they cannot explain the topic. Lastly, we look for people who see tutoring as a mentoring process and understand the importance of rapport and connecting with their students. 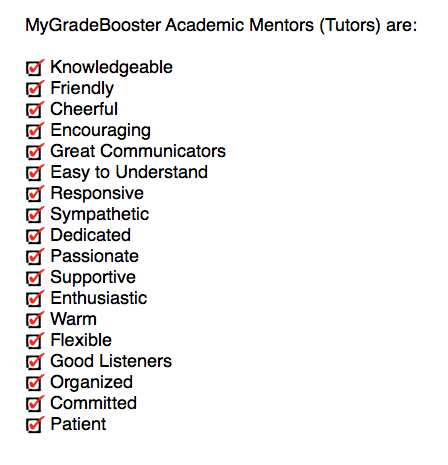 MyGradeBooster tutors are leaders with exemplary interpersonal skills. They have impressive list of achievements and are role models for young students. The common denominator of our tutors is that they all genuinely care about their students’ learning and progress. As a local business owner in Vancouver, we take great pride in the work that we do because we can see how much of an impact it has in our community. We root for our students. We help them to realize their own potential and greatness so that they can achieve their goals with confidence.